For the busy executive an office coffee vending machine offers the perfect pick-me-up to launch the day. For the health-conscious employee a vending machine in the office stocked with fruit juices offers a convenient solution. 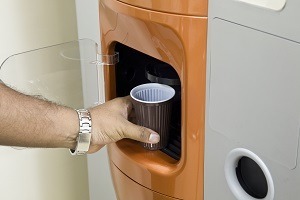 A hot drinks vending machine offering coffee, tea or hot chocolate is a great investment in workers’ productivity. Most employees will take advantage of an easy opportunity to grab a caffeinated drink to start the day, and many will return for another after lunch or in late afternoon. It is no secret that coffee and tea provide an alertness boost, which may contribute to steady productivity throughout the day. Whereas at one time office coffee meant a crusty machine churning out bitter black swill, today the market features a broad selection of sleek vending machines that produce high-quality espresso, cappuccino, and other specialty beverages. For a relatively small investment, you can offer your employees a productivity enhancer disguised as a special treat. A cold drinks vending machine is also an effective tool for keeping your staff productive. Factors such as a heavy workload, stress, and dry air due to air-conditioning or heating systems can affect the normal functioning of the body and increase water loss, even when we are not noticeably sweating. A lack of proper hydration during the working day can cause headaches, tiredness and loss of concentration. This problem is easily avoided by installing a cold drinks vending machine in your office space. As with a coffee machine, it will enable employees to satisfy their thirst in seconds rather than waste precious working time by leaving the office to find a soft drink, fruit juice or mineral water. You could opt for a simple water cooler instead, but employees will appreciate the broad range of choice provided by a vending machine. As with coffee machine vendors, intense competition has prompted cold drinks vending machine providers to offer many affordable options backed by dedicated service in order to attract your business. Fully-automated machines capable of stocking up to 500 drinks in a dozen varieties can be purchased or leased for less than you might think. Your employees will appreciate the easy availability of their favourite cold beverages, and you will even generate an additional stream of income for your business.